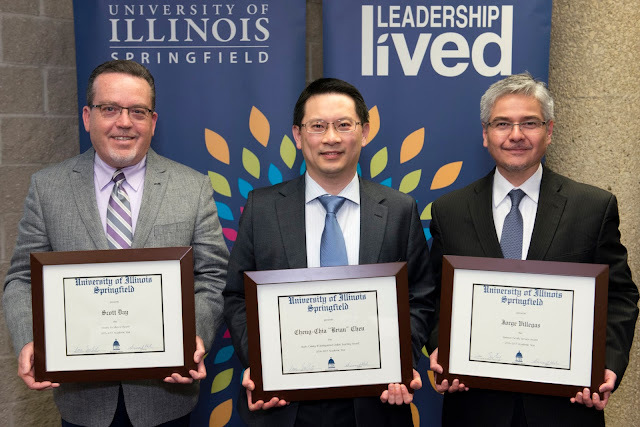 The University of Illinois Springfield held its annual Faculty Honors Reception on Thursday, May 4, 2017. Interim Vice Chancellor for Academic Affairs and Provost Jim Ermatinger presided over the ceremony honoring faculty members who have been recommended for tenure and/or promotion, been awarded sabbaticals, or granted emerita/emeritus status. Four major awards – the Pearson Faculty Award, the Spencer Faculty Service Award, the Burks Oakley II Distinguished Online Teaching Award and the Faculty Excellence Award - were also presented. The Faculty Excellence Award was given to Scott Day, professor and chair of the Educational Leadership Department. 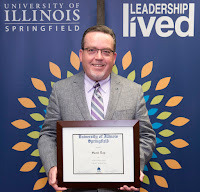 The award recognizes mid- and late-career colleagues who best exemplify the ideal of the teacher-scholar and whom the faculty recognizes as role models, based on sustained accomplishments in teaching and scholarship at UIS. The award is funded through the generosity of Wilbur and Margaret Wepner. During his eighteen years on campus, Day has consistently maintained high scores that exceed the college and university averages on the standard evaluation of teaching instrument. In the area of scholarship, Professor Day has focused his research agenda on online teaching and learning issues, a school law reference book for principals, and school district reorganization. Over the course of his career at UIS he has co-authored three books, seventeen journal and book chapters, and presented forty-five peer-reviewed papers at international, national, and state conferences. His work on using peer review and analytics to improve online courses has been cited forty-two times by other researchers since publication. His co-authored work on design-based approaches to improving online courses and pedagogical approaches to massive open online courses (MOOC’s) brought the research team international recognition for their papers presented in Finland, Scotland, and Ireland. Day came to UIS in 2000, was tenured and promoted to associate professor in 2006, and was promoted to the rank of professor in 2014. In 2010, Day received the Pearson Faculty Award which recognizes excellence in teaching. The Pearson Faculty Award for outstanding teaching was presented to Amy McEuen, associate professor of biology. The award recognizes a faculty member whose performance exemplifies UIS’ commitment to excellence in teaching and who stands among the very best teachers on campus. Such a teacher both informs and inspires students, giving them the knowledge and values with which they may become productive and enlightened citizens. The award was established by a gift from Dr. Emmet and Mary Pearson, longtime benefactors of the campus. Since coming to UIS, McEuen has taught seven different courses for lower division undergraduates and upper division graduates. She has developed six different courses targeted to a range of students. Even though McEuen teaches to a wide audience of students and teaches a variety of courses, she consistently maintains strong teaching evaluations. McEuen uses multiple approaches such as simplicity, engagement, interaction and active learning to help her students master complex subjects and cultivate their passion for the material. 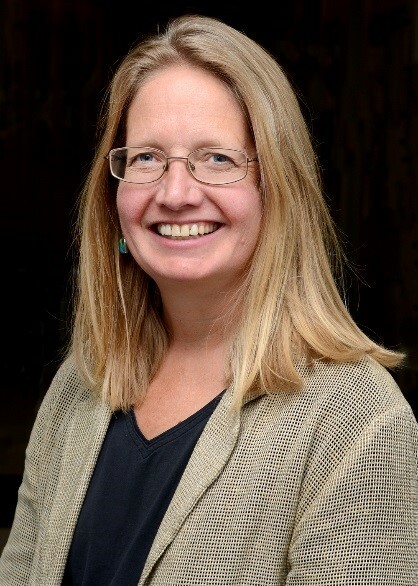 McEuen was recognized by her peers in the College of Liberal Arts and Sciences who awarded her the CLAS Faculty Excellence in Teaching Award in 2015. 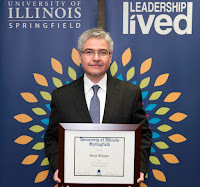 The Spencer Faculty Service Award was given to Jorge Villegas, associate professor and chair of the UIS Business Administration Department. Honoring Robert Spencer, founding president of Sangamon State University, this award recognizes faculty who best exemplify the ideal of the “professor-citizen” through public service and service to the academic community. Under Villegas’ leadership, the Business Administration Department has added three new BBA program concentrations in marketing, finance and sport management. 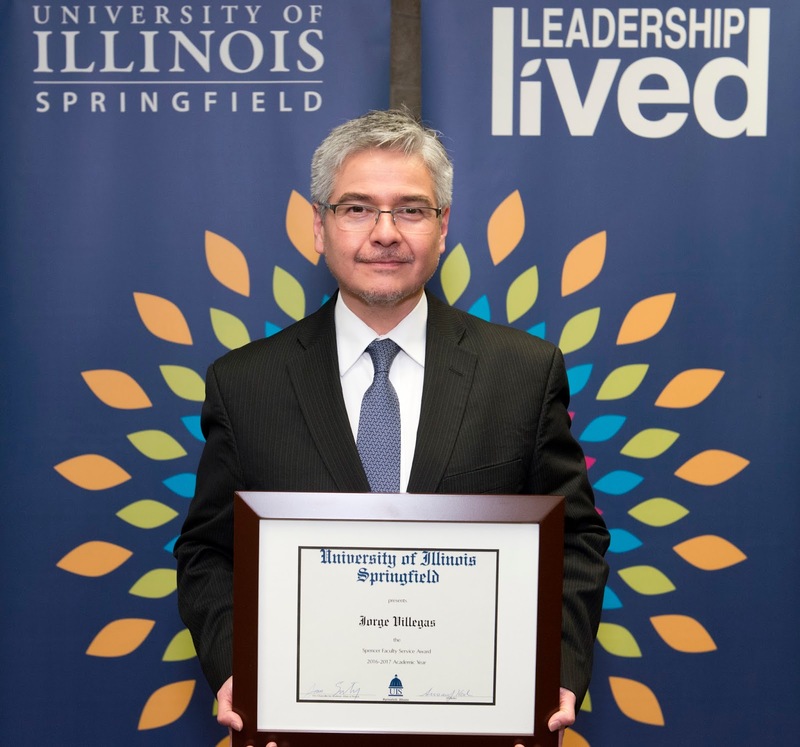 In addition to his responsibilities as department chair, since 2015 Villegas has also served as the chair of the economics program and has served as the director of the college-wide MBA program. His college-level service includes his work as adviser of the Beta Gamma Sigma honor society for business students. Villegas has been very active in campus governance, serving on campus senate as well as the University Senates Conference. He has served on a number of important campus and system search committees, including co-chairing the search committee for the vice chancellor of academic affairs & provost. Villegas also has an admirable record of community and professional service. He has worked with students and community members in support of healthcare literacy. For example, he has been part of the SIU-UIS Camden Coalition Healthcare Hot-Spotting Project, initiated in summer 2015, to help vulnerable populations get access to medical services that they need. As service to the profession, he has been on the editorial board of the “Journal of Advertising Education” since 2011, and has been a reviewer for several journals and conferences in his field. Cheng-Chia (Brian) Chen, assistant professor of public health, was honored with the Oakley Distinguished Online Teaching Award. The award was established by Burks Oakley II, who helped launch UIS’ online programs and was also in attendance at the event The Oakley Award recognizes UIS faculty members whose performance exemplifies the institution’s commitment to excellence in online teaching. According to his nominators, Chen strives to provide a student-centered learning environment because he thinks that students can engage with learning at a much deeper level when the instructor focuses on students’ needs, capabilities, learning motivations, and interests, as well as creates learning resources that provide diversified learning tools and activities for students. 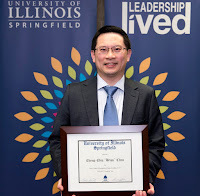 “Chen successfully demonstrates that he has integrated seamlessly the active learning, problem-based learning, and interactive learning strategies to create a comprehensive and inclusive educational experience for online students,” said Hanfu Mi, interim dean of the UIS College of Public Affairs & Administration. Chen’s teaching evaluations and student testimonials regarding their experiences in his online courses provide telling details about the long-lasting, positive impacts on them. “Dr. 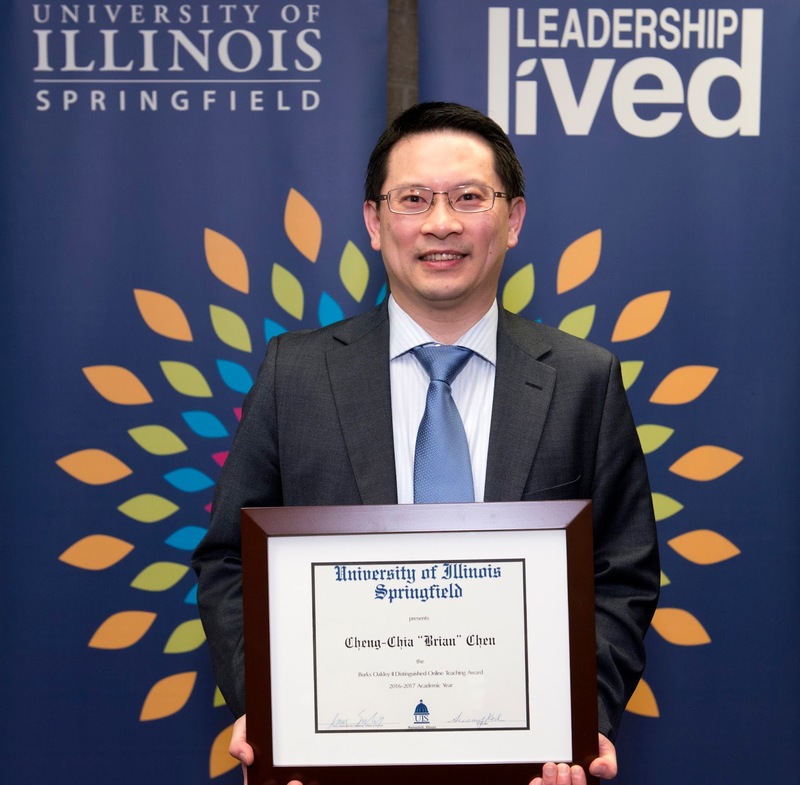 Chen’s dedication and ability to reach students by creating an online learning environment that successfully nudges students to actively engage with the courses on their own is remarkable,” said Mi. Recommended for tenure and promotion to associate professor were Mark Buxton, Accountancy; Meagan Cass, English & Modern Languages; Shane Harris, Art, Music, & Theatre; Stephen Johnson, Chemistry; Brian Kahn, Teacher Education Preparation; Holly Kent, History; Ann McCaughan, Human Development Counseling; Kay McChesney, Social Work; Gary Reinbold, Public Administration; Ann Strahle, Communication; and Benjamin Walsh, Management. Roghieh Gholami, an associate professor in Management Information Systems, was also recommended for tenure. Recommended for promotion to full professor were Adriana Crocker, Political Science, and Xiaoqing Li, Management Information Systems. Lynn Pardie, Psychology, received the designation of professor emerita. Sabbatical leaves were granted to Kristi Barnwell, History; Michael Burlingame, History; Michael Cheney, Communication; Heather Dell, Women & Gender Studies; Sibel Oktay Karagul, Political Science; Jorge Villegas, Business Administration; and Junfeng Wang, Public Administration.